With the top floor setting a full terrace, the views are truly incredible and very L.A. The terrace has a great West Hollywood unobstructed views of the Hollywood Hills to Downtown to the Westside and the rest of Mid-City. The place is two floors. The first level is indoor and the main dining room. It’s where chef Louis Tikaram uses many flavors of Southeast Asia, from small to large plates. 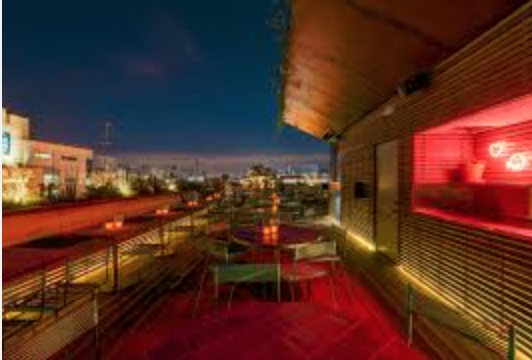 Then the amazing rooftop level lounge is where you can get small plate dining but enough for a full dinner. Dishes include a soft shell crab bun or L.P. nachos, with coconut cream chicken with crunchy cassava crackers. The Boba cocktails or shareable punch bowl-type intoxicants are original and worth a try. Smillie and Axwell are very into music (as you can tell from the name of the place) so the music is worth the drop by too.